First of all, it's important to know that there is not a separate, "blues" harmonica instrument - "blues harmonica" is instead a style of playing the harmonica. Blues harmonica is played most often on the major diatonic 10 hole harmonica. Harmonicas were invented in Germany in the 1800s and were at the time were basically used to play the "oom-pa-pa" or classical music or folk tunes of the time and of that area. The major diatonic harmonicas really haven't changed their tuning very much since that time. That doesn't mean that you have to play folk, classical, or oom-pa-pa music on the diatonic harmonica, it just means that you have to play in a different style, and with a few different techniques, in order to get the blues harmonica sound. The first that has to be done in order to be able to play in the blues harmonica style and get the blues harmonica sound is to no longer play using the built-in blow-oriented tuning of the diatonic harmonica. Instead, what you do is play in what's called second position or "crossharp". In second position playing, your root note for the harmonica is the #2 draw on the harmonica ("draw" means inhale in harmonica language), NOT the #1 blow (which is the standard folk, classical, oom-pa-pa position). The second position takes advantage of the DRAW CHORD which is built into the first four holes of the diatonic harmonica, which is a seventh chord - seventh chords are extremely important for blues music. So now you have a new orientation for your harmonica playing: away from the BLOW-oriented style of the first position, to the DRAW-oriented of the 2nd position which uses the root note #2 draw, or the root chord you could also say, on the diatonic harmonica. By starting on the #2 draw - what you have is a different scale that you are taking advantage of on the harmonica - technically it is a minor pentatonic scale. However, this particular pentatonic scale has flatted notes or "blue" notes in it in order to get that "bluesy" sound and is a specialized scale often called the blues scale. 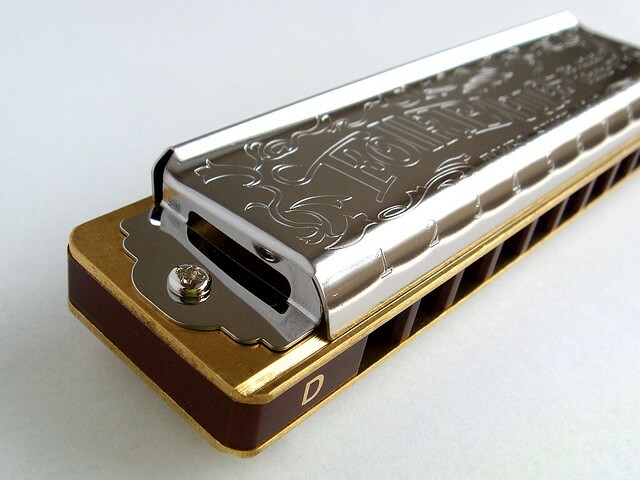 To get the flatted "blue" notes in the blues harmonica style it is necessary to become proficient at a technique called "bending notes" on the harmonica. Bending a note on the harmonica is actually creating a note that wasn't built into the harmonica - it's almost a magical thing. The harmonica works by air flowing a brass reed that is riveted in a slot. The harmonica has one blow reed and one draw reed right above it in each slot. When the harmonica is assembled, you don't see the slots, but just know that these reeds, 1 blow, and 1 draw, are in the same hole, one above the other. You have 10 holes in the typical major diatonic harmonica, and 10 blow and 10 draw notes, so you have twenty built-in notes. By bending notes, you can get considerably more notes, and more often than not it is these bent notes that give the harmonica its' "soul" and its' very "vocal" sound. How to bend a note is quite a study unto itself, but the main thing you are doing while bending a note is changing the air pressure while the air is flowing over the reed, and in almost all cases this will be on a draw note. To get started bending notes, choose one of the harmonica holes that usually is one of the easier notes to bend, the #2 draw. First, you must have a good single note technique. That is, you must be good at playing only one hole at a time without other holes leaking in their sound. Next - you draw in the #2 draw with that clear relaxed single note style so you can hear what that single note is supposed to sound like and imagine that you are articulating the vowel "E" while drawing in on the #2 draw. Three: Exhale so that you have a lot of air to work with on the #2 draw, and while drawing in saying "E", without changing anything else inside your mouth, change the vowel articulation to "OOO" or "AAAH". What this ultimately will do will be to change the air pressure inside that slot and will cause the brass reed to vibrate at a different rate, and the reed will be "bent" down.This gives you your bent note or "blue" note. Harmonicas come in many different keys: the higher the pitch of harmonica, the shorter the reed. The shorter the reed, the harder it is to bend the note, at least until you get used to it. So start with at least a midrange harmonica such as the key of C, or go to a lower pitch harmonica key such as an A or even lower, a G harmonica, to practice bending notes. The actual bending technique will be the same for all keys, but you will find it easier to learn the bending technique initially on the lower pitch harmonicas. 3. Getting the "missing" blue notes of the scale by using the bending technique. Blues harmonica is the root technique of almost all other harmonica styles, so whether you are a blues fan or not, it is a great place to start learning more fun techniques on the harmonica. You can go to harmonicasuperstart.com to get more help on how to play blues harmonica, especially the bending technique. Matthew Shelton is the founder of HarmonicaSuperstart.com, your best source for harmonica instruments, books, audio, and video. You CAN learn to play the harmonica, and you can carry it with you to have fun wherever you go!